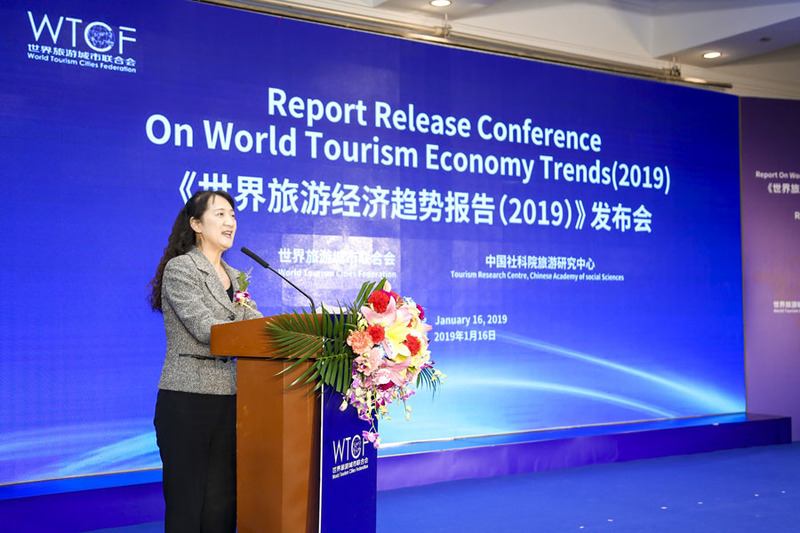 On January 16, 2019, the World Tourism Cities Federation (WTCF) and the Tourism Research Center, Chinese Academy of Social Sciences (TRC-CASS) jointly released the Report on World Tourism Economy Trends 2019. 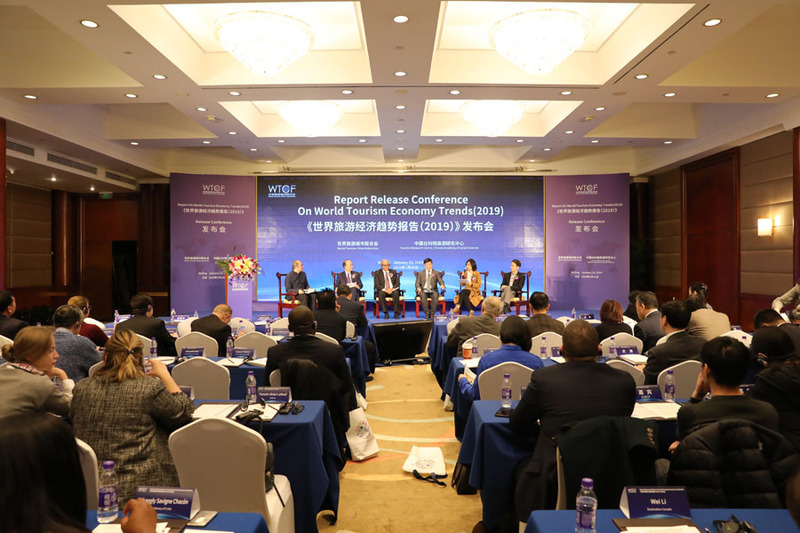 On January 16, 2019, the World Tourism Cities Federation (WTCF) and the Tourism Research Center, Chinese Academy of Social Sciences (TRC-CASS) jointly released the Report on World Tourism Economy Trends 2019. More than 60 delegates from WTCF, the Chinese Academy of Social Sciences, such foreign institutions in China as Panama Embassy and South African Embassy, Chongqing City and Chinese domestic tourism-related agencies, as well as more than 100 domestic and foreign media jointly participated in the release and forum discussion of the Report. The Report on World Tourism Economy Trends 2019 follows the previous analytical framework, focuses on the perspectives of global, regional, country, industry and city levels and makes a panoramic analysis of the development trend of world tourism economy from such seven aspects as global tourism economic development, regional development pattern change, global tourism investment and the role of cities in the global tourism economy. The Report on World Tourism Economy Trends 2019 summarizes the following characteristics: First, the global economic growth will slow down in 2019, but the tourism economy will rise steadily. Second, tourism development in five global regions is becoming more and more obvious, with the growth in Asia and the decline in Europe. Third, the scale and growth rate of tourism investment in Asia-Pacific are among the top in all continents. Fourth, the Report innovatively puts forward the concept of “T20” countries, which create 80% of the global tourism revenue. Fifth, the reform of payment means promotes the upgrading of tourism consumption. Cities are still the main destination for inbound tourists, and 95% of international cities are from Asia-Pacific, Europe and the Americas. Sixth, six major marketing innovations represented by virtual technology and whole industry chain cooperation create new tourism experiences. Seventh, cities are still the main destination for inbound tourists. 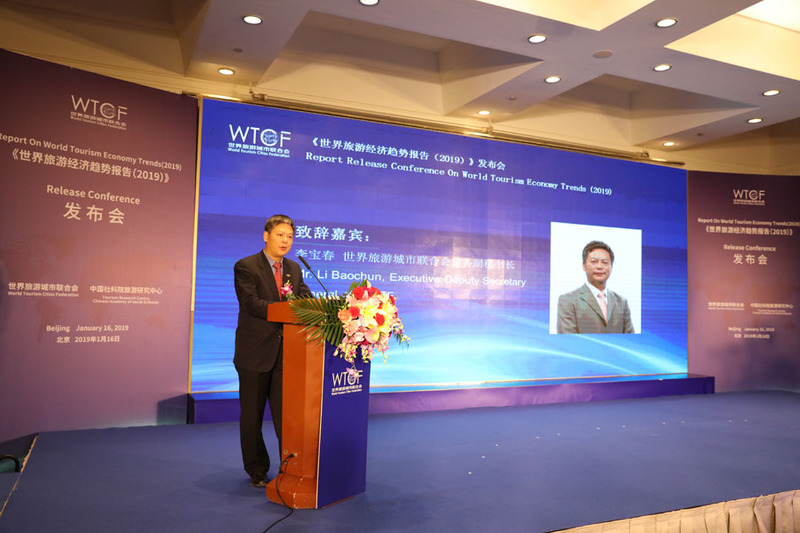 Li Baochun, Executive Deputy Secretary-General of WTCF, pointed out that in order to further study and judge the trend of world tourism economy development, predict the global tourism development’s future prospects, promote the world tourism economy’s sustainable development, reveal world tourism economy development’s annual characteristics, and better serve WTCF members, WTCF has publicly released the Report on World Tourism Economy Trends each year since 2016, sharing the research results with global counterparts and providing decision-making reference and intellectual support for governments of different nations, relevant cities and the tourism industry. Yan Kun, Secretary of the Party Committee of National Academy of Economic Strategy, CASS, believes that tourism is an important carrier of cultural exchange, social communication and trade circulation, as well as acts as an important force to connect the world, deepen cooperation, and drive development. 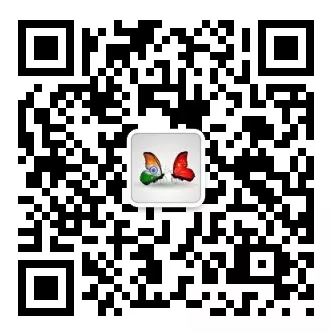 With global economic growth slowing down and trade friction increasing, it is of great significance to study the development of world tourism economy, provide insight into the changes, follow the trends, make positive efforts, and innovate constantly. Francisco Escobar, Ambassador of Panama, on behalf of international agencies, congratulated and spoke highly of the release of the Report. According to the content of the Report on World Tourism Economy Trends 2019, a forum discussion with the theme of "Connecting the World of Tourism" was held. Under the dual background of the current change in tourism consumption demand and the intensification of competition in market of tourism destinations, guests such as Wang Dingguo, Vice Chairman of Chongqing Cultural and Tourism Development Commission; Thandukwazi Nyawose, Economic Counselor of South African Embassy in China; Ge Yujing, Vice President of Tuniu; Gao Yanhong, Head of WeChat Pay Tourism Industry; Cao Zhigang, CEO of Dragon Trail Interactive, and others focused on the "Connectivity" feature, had an insight of tourism development trends, and shared their opinions on how to make tourism destinations more attractive so as to have in-depth dialogue and interpretation of the Report. Yan Kun delivered a speech. The total number of global tourism in 2018 reached 12.1 billion people, an increase of 580 million people over the previous year, with a growth rate of 5.0%. Compared with 2017, the growth rate dropped by 0.7 percentage points, and the total income of global tourism reached 5.34 trillion US dollars, accounting for 6.1% of global GDP, a decrease of 0.4% over the previous year. It is estimated that the total number of global tourism will reach 12.76 billion in 2019, with a growth rate of 5.5%. Compared with 2018, the growth rate will rise by 0.5 percent. The total global tourism revenue will reach 5.54 trillion US dollars, accounting for 6.0% of global GDP. WTCF is the world's first international tourism organization focusing on cities. It always upholds the core concept of “Better City Life through Tourism”, actively builds a multilateral exchange platform for world tourism, and strives to promote cooperation and exchanges among global tourism cities, comprehensively enhance the competitiveness and influence of tourism cities, so as to provide new vitality to the sustainable development of global tourism.